Note: This offer is still available if you missed it. There are only 1000 spots available. 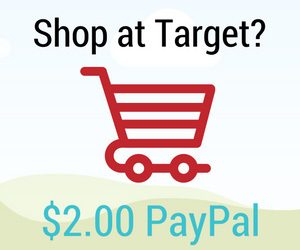 Possibly get $2.00 via PayPal for Completing the Target Shoppers Study! – Are you a Mom or Dad and you shop at Target? If so, you may qualify for this exclusive community. Take surveys and complete tasks for cash. Those who complete the qualifier survey will be paid $2.00 via PayPal. Please allow 4 to 6 weeks for receipt of your PayPal payment. There are only 1000 spots available for this community, so hurry – see if you qualify today.